Situated near to Widecombe in the Moor this famous logan stone (a naturally trigged boulder that can be rocked with relative ease) has a rather unique, well unique amongst logan stones, story. Unlike the majority of logan stones this one can only be moved by divine intervention as this story demonstrates. One day a posh stranger came into Widecombe and asked at the inn if anyone could direct him to The Rugglestone. Apparently he had heard much about its druidical connections and wished to see it for his self. A very obliging but aged local offered to guide him to the stone for a small remuneration. Ten pints of cider later the guide and his charge staggered off down the lane towards the famous stone. Before long the local was beaming with pride as with a sweep of his arm he introduced the stranger to the famous stone. The stranger stood for a moment in awe and then heartily set to trying to rock the logan. It didn’t budge an inch, he tried again but this time with a little more vigour, it still never moved. Looking directly at the bemused guide he asked if this was in fact the real Rugglestone. The poor fellow was indignant, “cawse tis, I’d lived yer for all me life and I am sartin, tis the ruggle stone”. Again the stranger tried to budge it, the veins in his neck stood out like ropes. “Well it won’t move” he yelled. “Aw, why din ee zay ee wanted un to move, I ud ‘ave brought the charch kay for ee”. Which roughly translated means that to make the stone log or rock the Widecombe church key and only the Widecombe church key had to be placed on it. Rowe, 1985, p.152 details the Rugglestone as “an immense oblong of rock, of which the computed weight is one hundred and fifteen tons. The length is about twenty two feet, by a breadth of about sixteen and a half feet, and it contains one thousand five hundred and fifty cubic feet. This huge mass rests on the supporting rocks beneath, so as top give the appearance of a huge cromlech.” When he published his book in 1848, Rowe commented that the rock could be logged with the help of a “stout walking stick”. Sadly the rock no longer loggs, either with the help of a stick or the church key. Hemery considers that sometime in the 1800’s something happened to stop the rock from logging. It is said that the rock was cleft in two at the precise moment the rocks were rent at the time of the Crucifixion. Additionally it is also believed that if cattle were to be driven through the gap they could be cured of most illnesses. 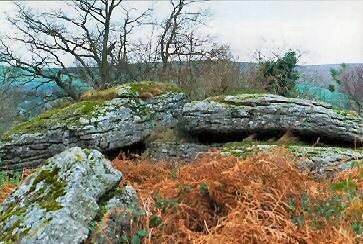 There are numerous ‘logan stones‘ or ‘loggin stones’ on Dartmoor, very few actually move today. They were formed when weathering caused a mass of granite to become detached from the parent-rock. This then became pivoted which gave it the ability to rock or be set in motion. Logan stones were at one time associated with the Druids because of their so-called magical powers. The ability to move huge heavy slabs with the minimum of pressure must have been viewed with awe by pagan man. Could the very fact that the tradition of using the church key to make the Rugglestone rock be an example of the Christian faith attempting to ‘sanctify’ an earlier pagan belief? Hemery, E. 1976 High Dartmoor, Hale London.